I've learned something about garage sales. If you see something you like, grab it before somebody else does. That's what I did when I saw this small end table on sale for five dollars earlier this summer. The table had several scratches, was marred with a water ring from a coaster-less drink, and badly needed a few fresh coats of stain or paint. What was most obvious to me, though, was that the table had potential. Loads of potential. 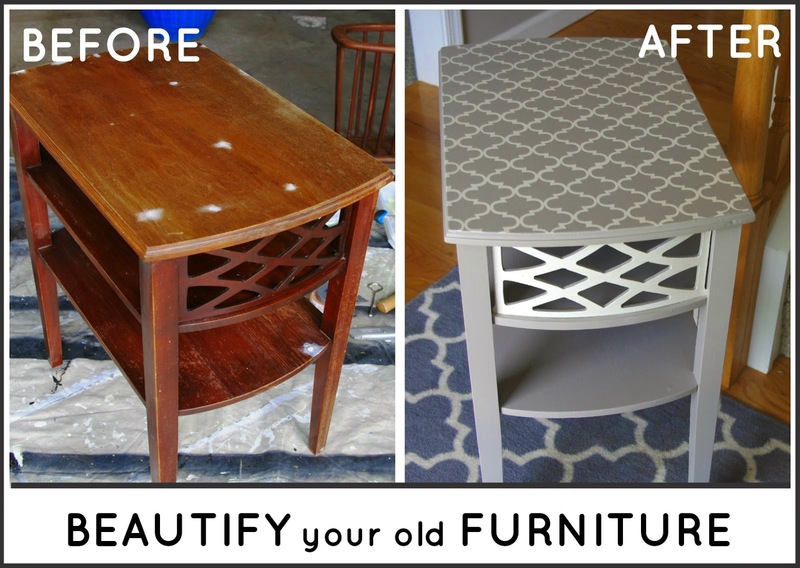 I fell in love with the decorative grill, and I knew the table could turn into something special with a little care. To start the restoration, I sanded the table, filled the scratches with wood putty, let the putty dry, re-sanded, and then wiped away all dust to have a clean surface to paint. 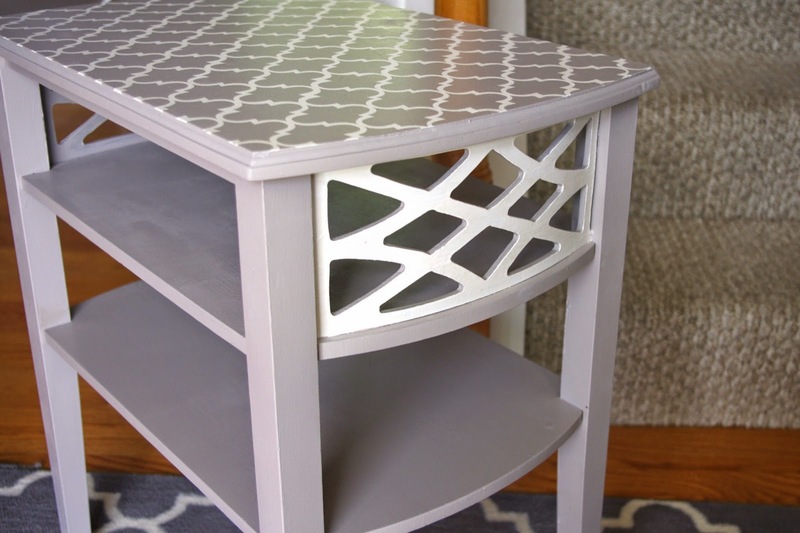 Since I wanted a neutral palate, I painted the entire table pale gray and contrasted the decorative grill with crisp white. 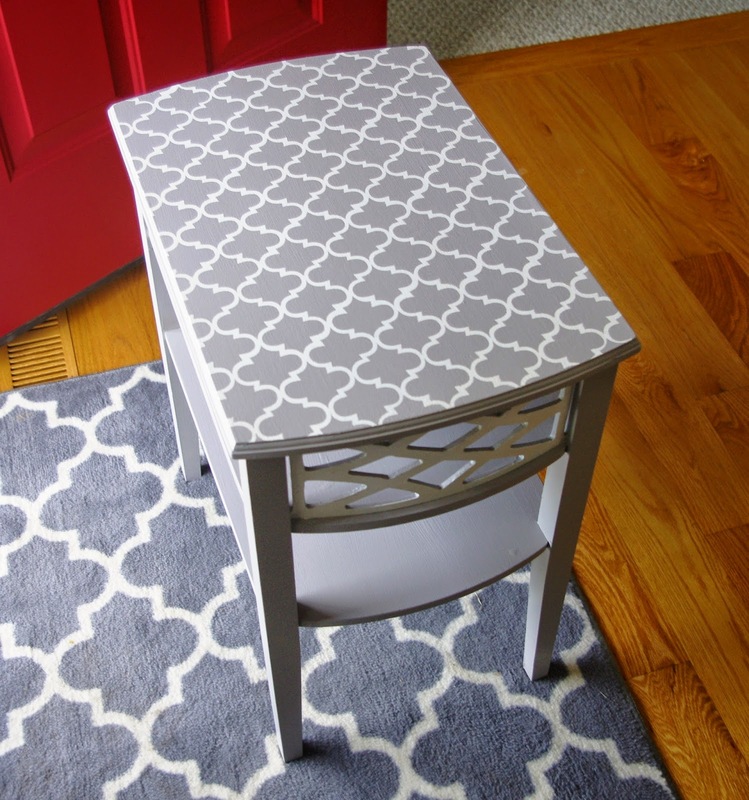 I wanted white to be the accent, not the main color, so I repainted the table top white and began stenciling on top with gray. The result is sleek and modern, and now the white on the grill is accentuated with the stenciled pattern on top. Let me tell you, this was the best garage sale find of the summer and such fun to complete. To think: five dollars for this table! Score! In a nutshell, you don't need to break the bank to add fun accent pieces to your home. Scout out garage sales or discount stores, and look for pieces with good bones that simply need a little love. I'm so proud of this table and the story behind it. What do you think of the transformation? Be sure to stop back tomorrow for one final post to conclude DIY week! Next up? Creative ways to fill picture frames beyond traditional photos! I love this table! You're so good at this stuff. One of our new favorite shows (on one of those dinky little free networks because my husband is the Cable Nazi) is called Knock it Off, where they decorate and redo different rooms for a fraction of the cost. It appeals to me in its frugality and also in its before and after scenes. I'm a sucker for good before and after pictures. Thank you so much! I've never seen that show, but based on your brief description I can tell that it speaks my language. I'm a sucker for good before and after pictures, too! I'm so pleased by how this table turned out that I want to carry photos around with me to show it off when I'm in the line at the grocery store or at the park with the kids. You know, kind of like a proud grandparent, but a little weirder. Love this Robin! Great job!